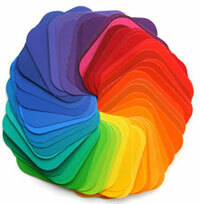 Colors effect our body and mind very much. The purest and most thoughtful minds are those, which love, colors the most. Colors according to Vaastu Shastra play a vital role in bringing balance to our minds as well as bodies and to stimulate our energy. Therefore colors in a Home, Office, Factory, Shop should be coordinated with the colors of respective planets and elements associated with different directions. This will enhance the energy flow around every individual in the related area. Here are some guidelines on particular colors, which will help you to choose the right Vaastu colors for every room. Red: It symbolizes bravery and power. It’s dramatic, emotional and active. It should not be used in bedrooms because of its energizing quality. It can also be stressful for those who are nervous. Orange: This color inspires spirituality and power. It encourages positive feeling, happiness, joy and good social relationship. Peach color can also be used as it is a cool color. Green: It represents nature, hope, freshness. It brings harmony, quick healing, good and healthy environment to the room. Most of the hospitals are using this color because of its quick healing quality. Green color is good for study room as it rejuvenate the ideas. Yellow: It gives a sense of patience and wisdom. It represents sunlight which symbolizes power. If a room gets direct sunlight, do not paint the walls with yellow color. For ’Pooja’ room, yellow color is perfect. Blue: It symbolizes spring, new growth and relaxation. This is cool color can be used for bedrooms or meditation room. Purple: This color inspires faith, respect and trust. Never paint entire room in purple color as it may be overpowering. However a light purple color can be used for a calming environment. White: it’s an elegant color and looks good when combined with other colors. White ceilings are suggested by most of the people as it reflects the light and brightens the room. This color can be used in north-west bedroom. Pink: This color represents joy, happiness and pure feeling. It can be used in master bedroom and bedrooms in the South and Southwest. Black: it indicates lack of hope and confidence. It gives us depressed and tensed feel. Avoid black and gray color in house as these may cause frustration and hopelessness. Bedroom : Pink is an auspicious color for bedroom. Light blue and light green are also good for bedroom. Choose green color for children’s bedroom because it can helps in study of children. Living Room: Yellow, blue, green, tan and beige are best colors for living room as these colors are pleasant for guests. Kitchen: The white is the best color for kitchen. Yellow, orange, rose pink, chocolate and red colors are also good colors for kitchen. Bathroom: It can be of white or a mix of black and white or gray colors. Pink and other pastel colors are also good. Dining Room: The Pink, green and blue colors are good for dining room as this place needs to be painted in refreshing colors for the family eats and entertains there. Avoid black and white or mixture of black and white in the room. Green drives away anxiety, blue cures insomnia, red solves your over weight problem, orange improves your appetite, pink relieves from tension and yellow improves memory. Some colors add zest to life and give positive attitude where as some colors act the opposite way. Do not use bright colors on walls facing South and West windows and doors, as they reflect light and cause glare. Keep those doors and windows closed during day time so that the bright rays do not reflect in the room. If a room has poor daylight, it should be painted in light color and if a room gets good amount of natural light throughout the day. If a room has only a North window, which admits cold light, we should not use blue on the walls. If a room gets much direct sunlight, it is not advisable to paint the walls yellow or peach. It is nearly better to have ceilings white and the ceiling temperature should be less than the human body temperature.